Cap ellipsoid, to obtuse-conic, 0.5-1.5 cm tall, 0.3-0.7 cm broad at the margin, the latter typically pinched to the stipe, not expanding with age, decorated with pallid fibrils up to 1.0 cm long; surface lubricous when moist, obscurely striate, medium-brown when fresh, gradually fading from the disc, the margin usually darker in age; context thin, buff-colored, <1.0 mm; odor and taste untested. Gills adnexed, close to crowded, slightly anastomosed near the margin, at maturity, brown with a rusty or cinnamon tinge. Stipe 2.0-6.0 cm long, 0.5-1.0 mm thick, spindly, straight to sinuous, stuffed, becoming hollow; surface of apex pale-tan to pale-vinaceous, the lower portion dark-brown to mahogany-brown, fibrillose-striate, frequently twisted-striate, the ornamentation buff to pale-tan over a darker background; veil consisting of long, buff fibrils, either adhering to the cap margin or forming a loose, fibrillose zone just below the unexpanded cap. Spores 10.0-12.5 x 6.0-7.0 µm, elliptical to almond-shaped in face-view, slightly inequilateral in side-view, smooth, moderately thick-walled, apex truncate with a germ pore, hilar appendage not conspicuous. 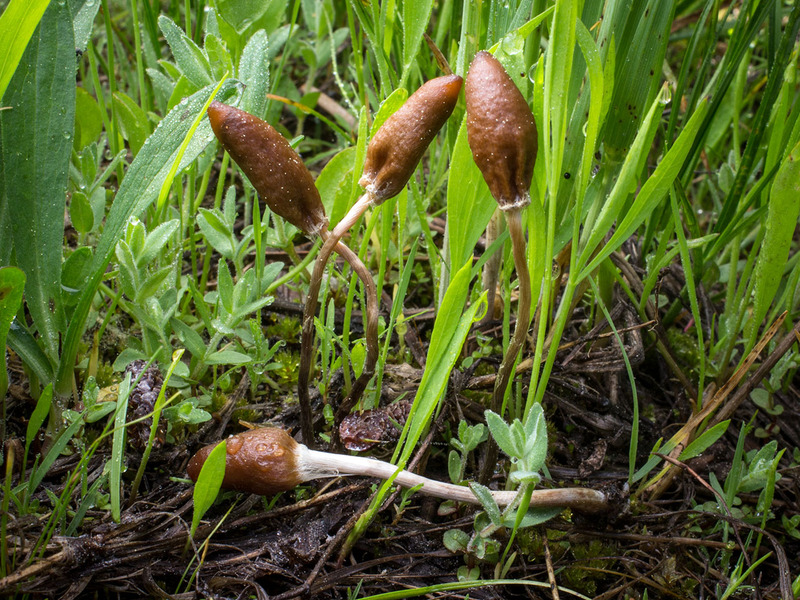 Scattered to gregarious in bogs, seepage areas, moist meadows at higher elevations of the Sierra, probably also the Coast Range; fruiting from late spring to early summer; rare. 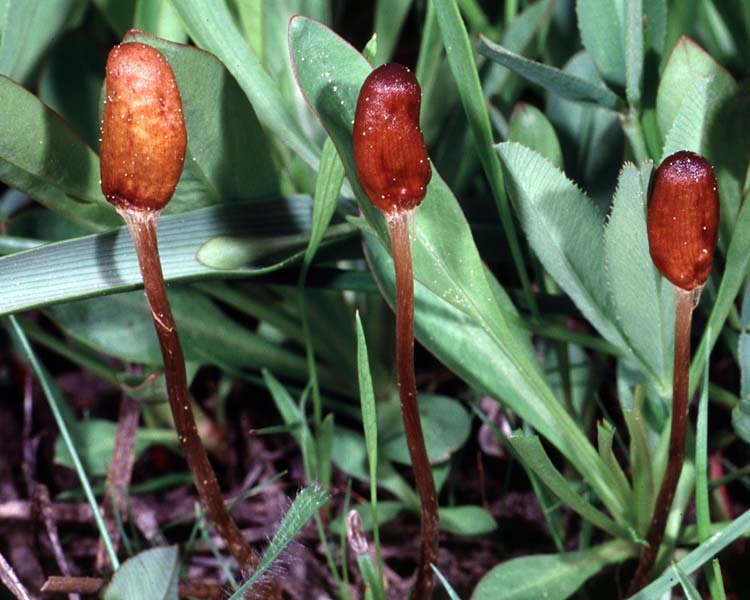 A rare, diminutive montane species, Galeropsis polytrichoides is seldom found by accident. It fruits in moist meadows, but to pick it out from the mosses with which it often grows and resembles, is a test of visual acuity. 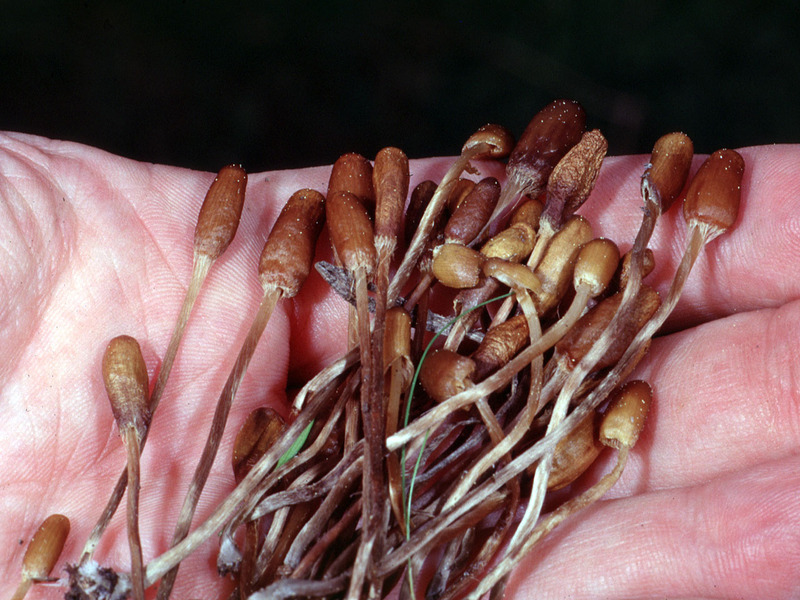 In particular it resembles the spore capsules of the moss Polytrichum. 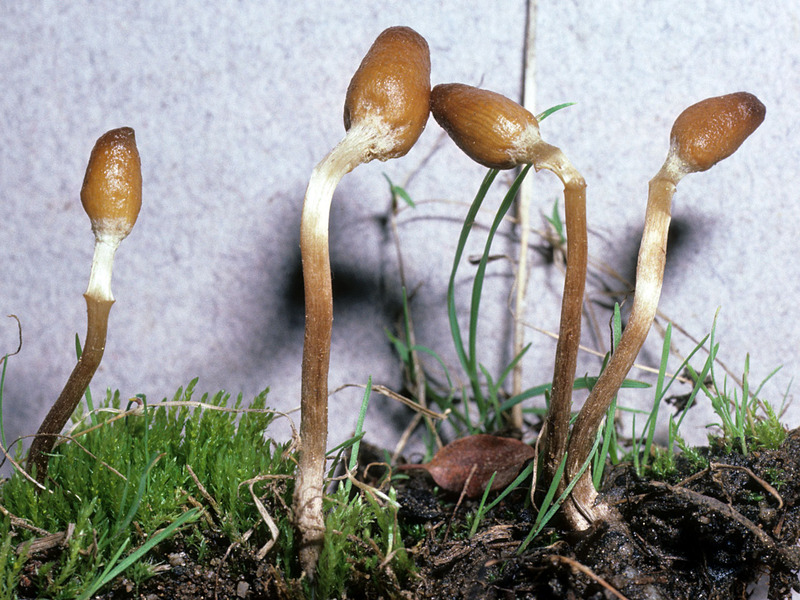 An unrelated look-alike, secotioid species, Leratiomyces cucullatus, also shares this characteristic. 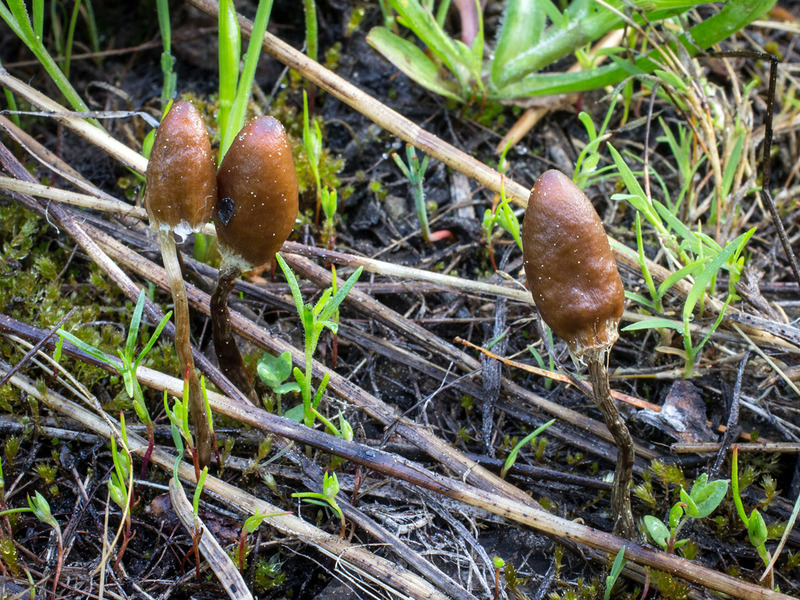 It differs, however, in having a more acutely conic, lighter-colored cap, lacking the long trailing marginal fibrils of Galeropsis polytrichoides. Thiers, H.D. & Watling, R. (1971). Secotiaceous Fungi from Western United States. Madroño 21: 1-9. Zeller, S.M. (1943). 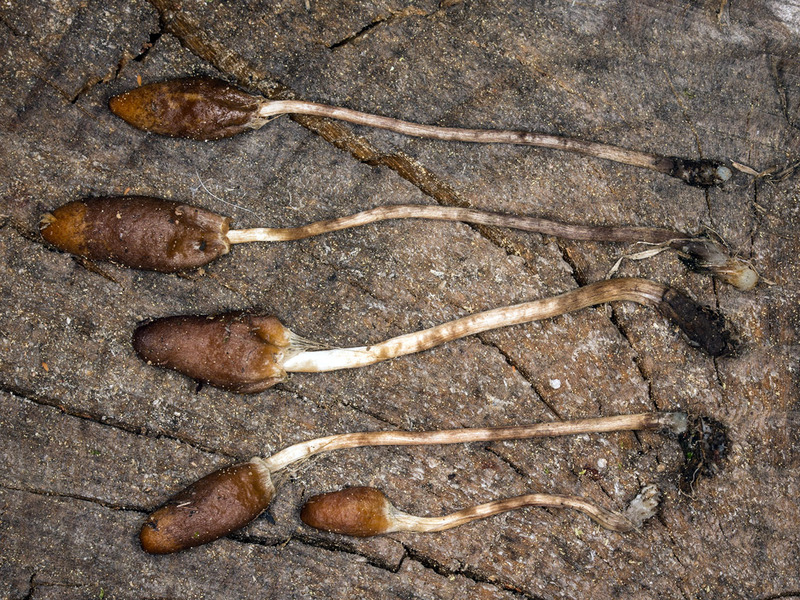 North American species of Galeropsis, Gyrophagmium, Longia, and Montagnea. Mycologia 35: 409-421.